Tobins' Tastes: Saved 74% at CVS- Free Vitamin Water! Spent $8 for $27 worth! I have been a real slacker at playing the drugstore game lately. I have actually been slacking at couponing in general. Our schedules have been crazy with work, the house, life and the holidays. That is the beauty of couponing. I can go a few weeks without needed much and we don't have to without anything. I was pretty much planning on just doing Publix on Thursday this week and maybe Target over the weekend but then I got an email from CVS with a coupon for a FREE 6-pack of Vitamin Water when you spent $10. There was also an Ibotta credit for that item too so I figured it was worth looking at the ad and seeing if there was $10 worth of stuff I wanted/needed. 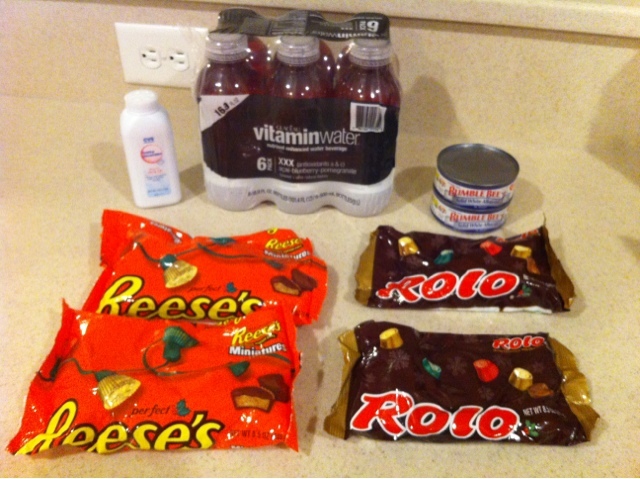 When I saw that Reeses/Rolos were on a good sale and I had coupons I knew exactly what I would spend $10 on to use my coupon. I was needed them anyways to make these quick and easy Pinterest Pretzel Bites for my holiday baking/gift giving. I also earned $3 in ECB's for buying the $10 worth (on sale but before coupons) of candy. I debated just holding on to my ECB's for next time but I always end up losing them or forgetting about them so I figured I would grab a few sale items so I could use them. Make sure to come back tomorrow for my regular weekly totals Publix post! Made it FREE plus a .75 cents moneymaker!